congatec is an innovative and experienced manufacturer of Qseven, COM Express, XTX and ETX embedded computer boards. The highly skilled employees have more than 200-manpower years of experience in the fast growing embedded computer industry. Based in Deggendorf Germany, the company’s objective is to engineer and market industrial computer modules based on standard form factors. 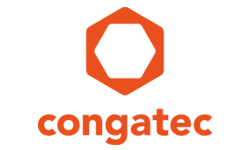 congatec’s products are available for all business segments and industries. Customers can be found in industrial control, medical, automotive supplies, aircraft and transportation fields. Typical applications are machine control, vending machines and visualization terminals. congatec’s main know-how includes the support of our embedded BIOS features, excellent driver support as well as full-featured board support packages. Customers receive complete product lifecycle support starting early during the design-in stage. congatec products are manufactured by specialized contract manufacturers who fulfill the latest quality standards.